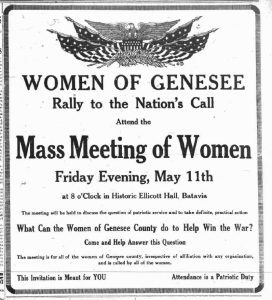 On April 6, 1917, Genesee County awoke to a lily-white landscape. Snow had fallen softly overnight, large wet flakes settling six inches deep, clinging to limbs and branches, frosting and hushing the grey-skied morning. It was a fitting start to a Good Friday; lovely, somber, purified, still. Ordinarily, the word “peace” might have come to mind. But everyone in the county knew that this day would bring the opposite. 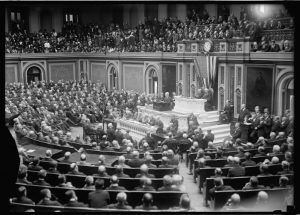 Four days earlier, President Woodrow Wilson had convened a special session of Congress, and after recounting the events leading up to the moment, had asked for a declaration of war against Germany. 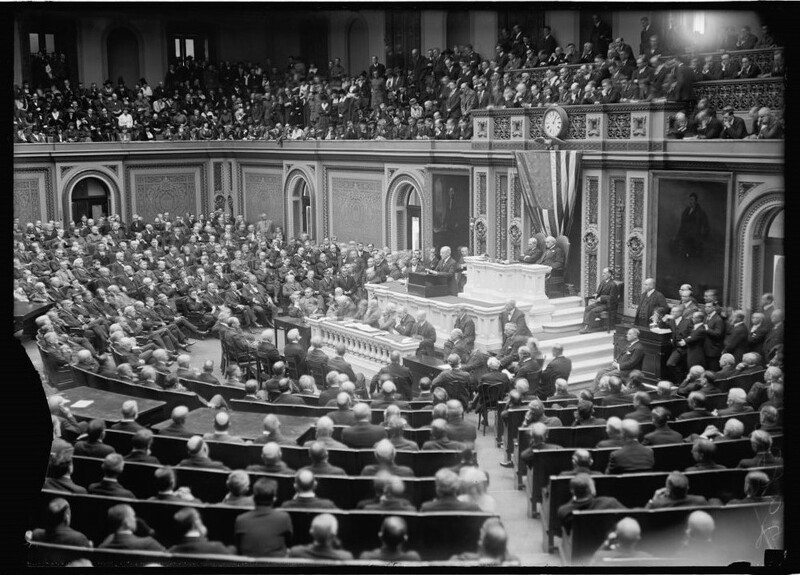 Two days after Wilson’s speech, on April 4, the Senate voted 82 to 6 in favor of war. And at 3 o’clock in the morning on April 6, as snow tumbled in the darkness across Genesee County, the House of Representatives concluded 17 hours of debate by voting “yes” 373 to 50. 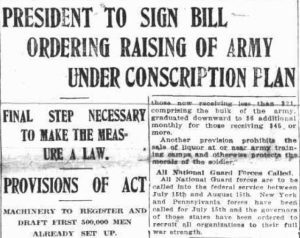 At 1:18 pm, President Wilson signed the resolution, and the country was officially at war. 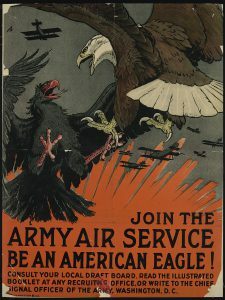 Genesee County’s citizens hadn’t waited for an official declaration to express support for fighting the Kaiser, however. Wilson’s speech before Congress had already inspired patriotic demonstrations and rallies. And the weeks to come would bring many more. 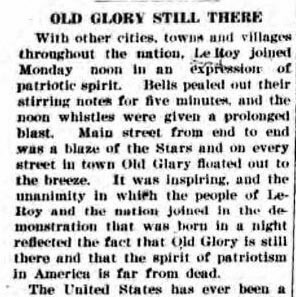 “With other cities, towns, and villages throughout the nation, Le Roy joined Monday noon in an expression of patriotic spirit. Bells pealed out their stirring notes for five minutes, and the noon whistles were given a prolonged blast. 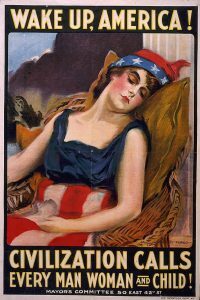 Main street from end to end was a blaze of the Stars and on every street in town Old Glory floated out to the breeze. Genesee County responded overwhelmingly. 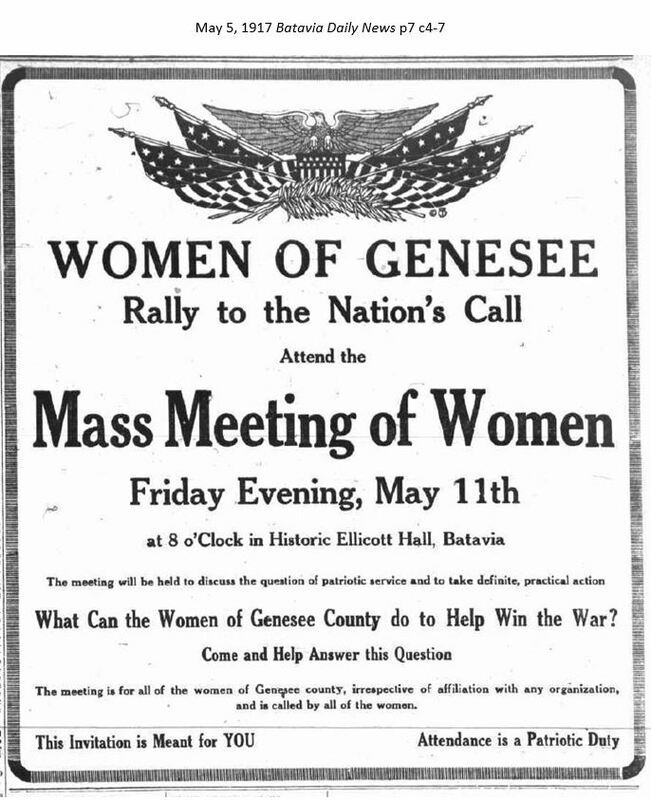 Women, led by the county’s suffragists, met to plan and organize their roles in the war effort. Farmers held mass meetings and pledged to work hundreds of additional acres. 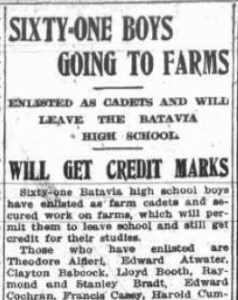 Boys from the county’s high schools enlisted in the state’s Farm Cadets program, allowing them to work on farms toward the war effort in lieu of classroom time. 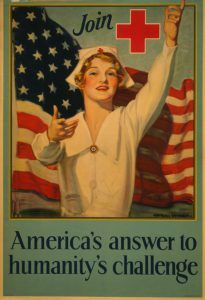 Every community held parades and rallies, and formed Red Cross chapters. Towns, factories and businesses held flag raisings. The Stars and Stripes waved from most homes. 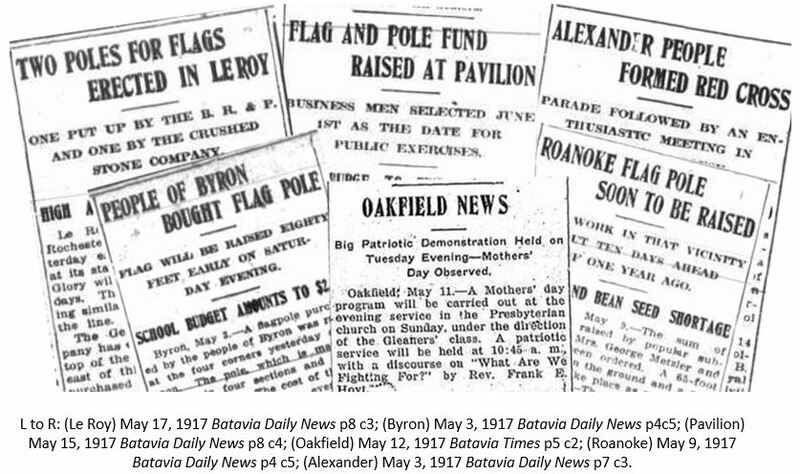 By the end of April, local newspapers were reporting flag shortages. 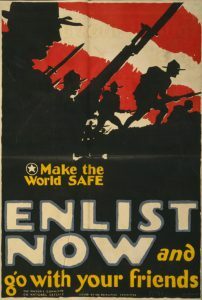 April’s end also brought Congressional approval of the Selective Service Act, designed to raise an army of more than 500,000 men within a dozen weeks. 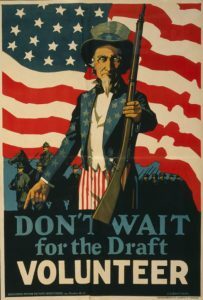 President Wilson signed the law on May 18, and soon designatedJune 5 as National Registration Day, when all men between the ages of 21 and 30 would be required to register for the draft. Three days later, Genesee County Sheriff Freeman Edgerton announced the names of draft officials and registration locations in every community. The system was in place. Many in the county, however, had already enlisted, and more would sign up in the days ahead. 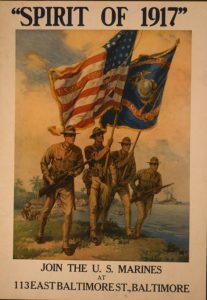 Some wanted to be with friends who were joining, or preferred a particular unit or branch of service. Most were simply eager to get into the fray. 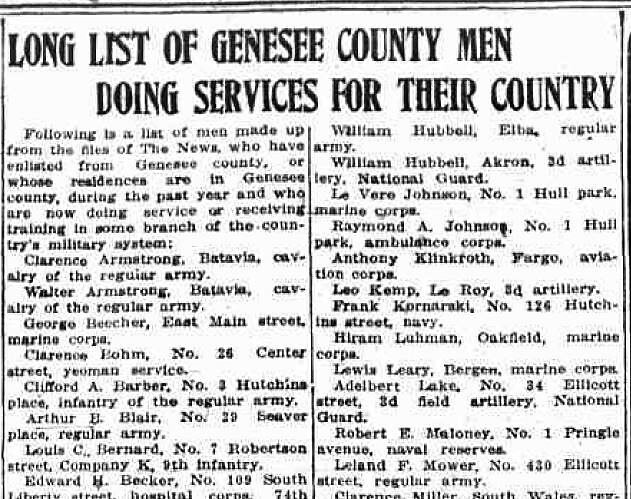 On May 25, the Batavia Daily News published a list of 118 Genesee County men, many of them new enlistees, who were already serving their country. Within a year, the number would increase tenfold. 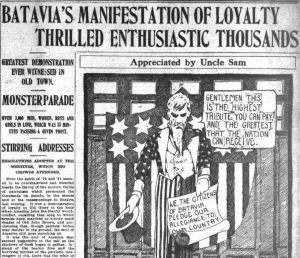 On May 26, 1917, in anticipation of an upcoming Memorial Day that would see patriotic parades of historic proportions throughout the county, the Batavia Times published an editorial that would prove all too prophetic. Many of our young townsmen have been called to the colors, and many more are to be called, and perhaps ere the observance of this day comes again, some of our young men may have lost their lives in battle, and there may be many sorrowful hearts in our immediate vicinity. 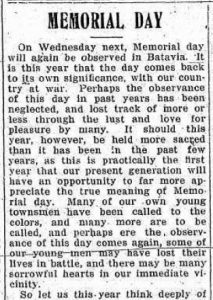 Indeed, nine of the men on the Batavia Daily News‘s May 25 list of those already in the service would not survive the war–Clifford A. Barber, Arthur L. Calkins, Howard Fay, William Hyde, Hiram Luhman, Carl J. Nielson, Robert Spencer, Peter J. Schlick, and Elva Springer. And they would be joined by 58 others on Genesee County’s World War I Honor Roll. 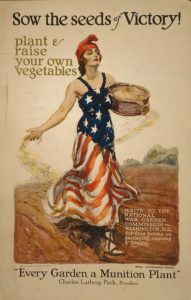 Retrieved from the Library of Congress: “President Woodrow Wilson Addressing Congress,” 1917 (https://www.loc.gov/item/95504407/); “Wake up America!”, James Montgomery Flagg, N.Y., The Hegeman Print (https://www.loc.gov/item/91726511/); “Sow the Seeds of Victory!”, James Montgomery Flagg (https://www.loc.gov/item/2002712333/); “Join [Red Cross symbol]”, Hayden Hayden, Snyder & Black Inc. N.Y. (https://www.loc.gov/item/2002711989/); “Don’t Wait for the Draft–Volunteer,” Guenther (https://www.loc.gov/item/2001700146/); “Make the World Safe–Enlist Now and Go with Your Friends,” Arthur N. Edrop, N.Y., The Hegeman Print (https://www.loc.gov/item/2001700145/); “Spirit of 1917” (https://www.loc.gov/item/2002698563/); “Join the Army Air Service, Be an American Eagle,” Charles Livingston Bull, Alpha Litho. 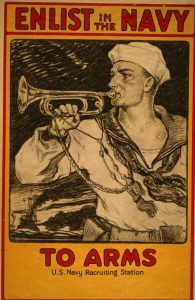 Co., Inc., N.Y. (https://www.loc.gov/item/95503123/); “Enlist in the Navy–To Arms,” Milton Bancroft (https://www.loc.gov/item/2002699395/). 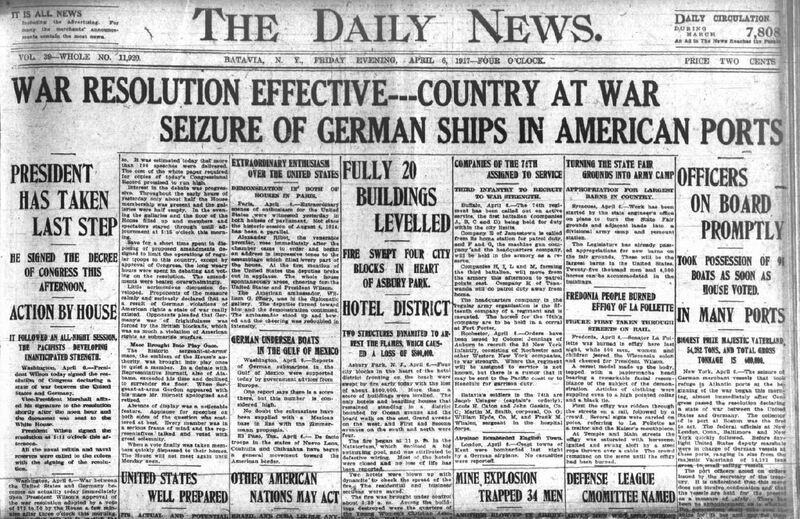 Newspaper clips: Courtesy of fultonhistory.com.